Researchers playing with a cloud of ultracold atoms uncovered behavior that bears a striking resemblance to the universe in microcosm. Their work, which forges new connections between atomic physics and the sudden expansion of the early universe, will be published in Physical Review X and highlighted by Physics. "From the atomic physics perspective, the experiment is beautifully described by existing theory," says Stephen Eckel, an atomic physicist at the National Institute of Standards and Technology (NIST) and the lead author of the new paper. "But even more striking is how that theory connects with cosmology." In several sets of experiments, Eckel and his colleagues rapidly expanded the size of a doughnut-shaped cloud of atoms, taking snapshots during the process. The growth happens so fast that the cloud is left humming, and a related hum may have appeared on cosmic scales during the rapid expansion of the early universe–an epoch that cosmologists refer to as the period of inflation. The work brought together experts in atomic physics and gravity, and the authors say it is a testament to the versatility of the Bose-Einstein condensate (BEC)–an ultracold cloud of atoms that can be described as a single quantum object–as a platform for testing ideas from other areas of physics. "Maybe this will one day inform future models of cosmology," Eckel says. "Or vice versa. Maybe there will be a model of cosmology that's difficult to solve but that you could simulate using a cold atomic gas." It's not the first time that researchers have connected BECs and cosmology. Prior studies mimicked black holes and searched for analogs of the radiation predicted to pour forth from their shadowy boundaries. The new experiments focus instead on the BEC's response to a rapid expansion, a process that suggests several analogies to what may have happened during the period of inflation. The first and most direct analogy involves the way that waves travel through an expanding medium. Such a situation doesn't arise often in physics, but it happened during inflation on a grand scale. During that expansion, space itself stretched any waves to much larger sizes and stole energy from them through a process known as Hubble friction. In one set of experiments, researchers spotted analogous features in their cloud of atoms. 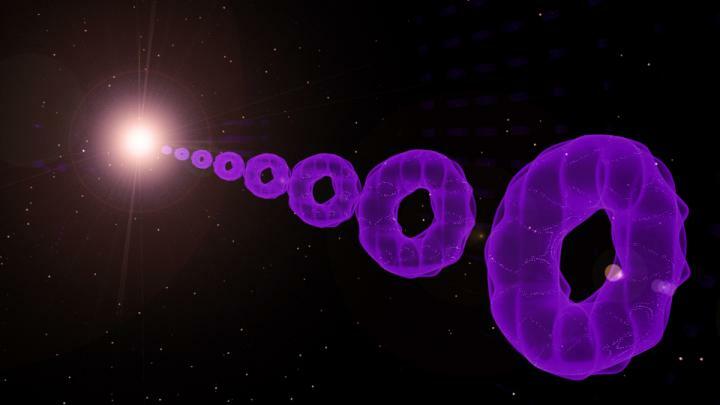 They imprinted a sound wave onto their cloud–alternating regions of more atoms and fewer atoms around the ring, like a wave in the early universe–and watched it disperse during expansion. Unsurprisingly, the sound wave stretched out, but its amplitude also decreased. The math revealed that this damping looked just like Hubble friction, and the behavior was captured well by calculations and numerical simulations. "It's like we're hitting the BEC with a hammer," says Gretchen Campbell, the NIST co-director of the Joint Quantum Institute (JQI) and a coauthor of the paper, "and it's sort of shocking to me that these simulations so nicely replicate what's going on." In a second set of experiments, the team uncovered another, more speculative analogy. For these tests they left the BEC free of any sound waves but provoked the same expansion, watching the BEC slosh back and forth until it relaxed. In a way, that relaxation also resembled inflation. Some of the energy that drove the expansion of the universe ultimately ended up creating all of the matter and light around us. And although there are many theories for how this happened, cosmologists aren't exactly sure how that leftover energy got converted into all the stuff we see today. In the BEC, the energy of the expansion was quickly transferred to things like sound waves traveling around the ring. Some early guesses for why this was happening looked promising, but they fell short of predicting the energy transfer accurately. So the team turned to numerical simulations that could capture a more complete picture of the physics. What emerged was a complicated account of the energy conversion: After the expansion stopped, atoms at the outer edge of the ring hit their new, expanded boundary and got reflected back toward the center of the cloud. There, they interfered with atoms still traveling outward, creating a zone in the middle where almost no atoms could live. Atoms on either side of this inhospitable area had mismatched quantum properties, like two neighboring clocks that are out of sync. The situation was highly unstable and eventually collapsed, leading to the creation of vortices throughout the cloud. These vortices, or little quantum whirlpools, would break apart and generate sound waves that ran around the ring, like the particles and radiation left over after inflation. Some vortices even escaped from the edge of the BEC, creating an imbalance that left the cloud rotating. Unlike the analogy to Hubble friction, the complicated story of how sloshing atoms can create dozens of quantum whirlpools may bear no resemblance to what goes on during and after inflation. But Ted Jacobson, a coauthor of the new paper and a physics professor at the University of Maryland specializing in black holes, says that his interaction with atomic physicists yielded benefits outside these technical results. "What I learned from them, and from thinking so much about an experiment like that, are new ways to think about the cosmology problem," Jacobson says. "And they learned to think about aspects of the BEC that they would never have thought about before. Whether those are useful or important remains to be seen, but it was certainly stimulating." Eckel echoes the same thought. "Ted got me to think about the processes in BECs differently," he says, "and any time you approach a problem and you can see it from a different perspective, it gives you a better chance of actually solving that problem." Future experiments may study the complicated transfer of energy during expansion more closely, or even search for further cosmological analogies. "The nice thing is that from these results, we now know how to design experiments in the future to target the different effects that we hope to see," Campbell says. "And as theorists come up with models, it does give us a testbed where we could actually study those models and see what happens." The new paper included contributions from two coauthors not mentioned in the text: Avinash Kumar, a graduate student at JQI; and Ian Spielman, a JQI Fellow and NIST physicist.